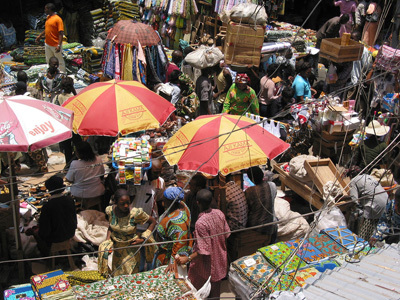 Sandgrouse Market which is One of the oldest markets built during the colonial era in Lagos the will soon be demolished. An agreement was signed by The Lagos State Government on Friday with DHB Construction Ltd and leaders of Sandgrouse Market to commence redevelopment of the market to modern standard. The re-construction operation of The market which is located on the corner piece between Simpson Street and Louis Street in central Lagos will soon commence. Queen Park Estate Shimawa is behind The Redemption Camp Grounds of The Redeemded Christian Church of Christ and also close to the new Auditorium site of the RCCG. 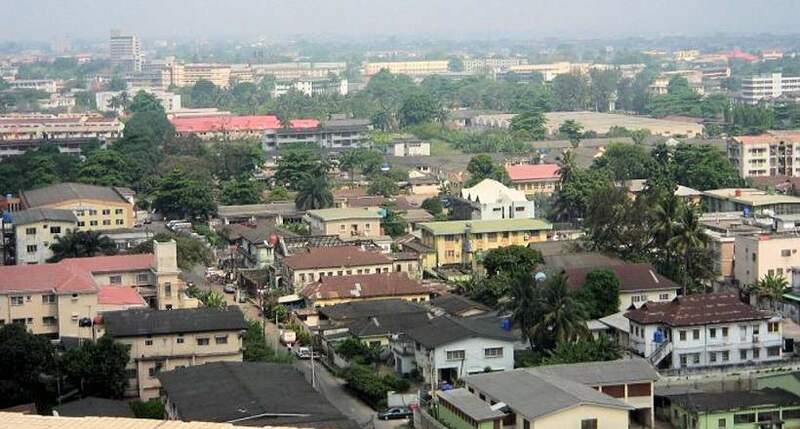 It is a mere 25 minutes drive from the heart of Lagos, ikeja. 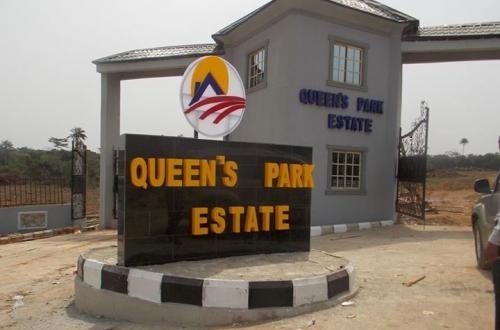 Queens Park Estate Shimawa offers you Plot(s) of land at Flexible and Affordable Prices, Immediate Allocation, Immediate Habitation, Immediate Documentation, Proximity to Lagos Central, Dry land and No-Rafting. Become a Landlord by taking advantage of our Installment Package. A plot cost N1,200,000 Naira (i.e. One Million and Two Hundred Thousand Naira). 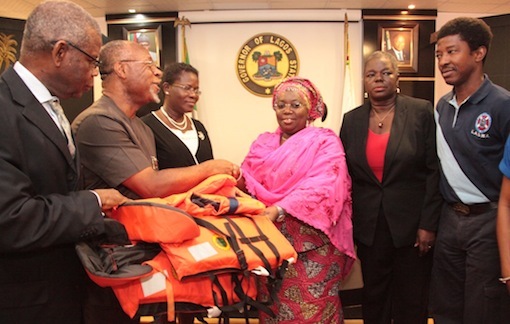 Two thousand four hundred life jackets were donated by Total Exploration and Production Nigeria Limited to Lagos state. This was to effect the control of persistent boat mishaps in the state’s waterways. The Governor received the donation from Charles Ngoka the Deputy managing director of the company. It was received at the 2015 world safety day celebration organized by the Lagos State Safety Commission at the State House, Ikeja, Lagos. The process of sharing $2.1 billion with federal, state and local governments in Nigeria has commenced to minimize a growing backlog of debts and restructure short-term loans. This was confirmed by the vice president’s spokesman on Monday. 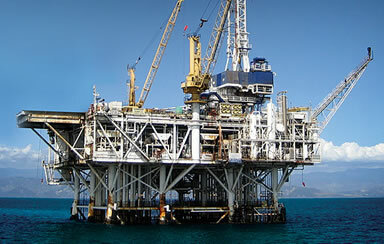 There was an announcement of sharing of revenues from the state-owned Nigeria Liquefied Natural Gas Company earlier this month after governors of the 36 states requested federal government support from President Muhammadu Buhari. This was due to the fact that many states have been unable to pay its staffs. The vice president’s spokesman Laolu Akande confirmed that the implementation of a three-pronged financial intervention of President Muhammadu Buhari to assuage workers plight and support the states is now in progress. 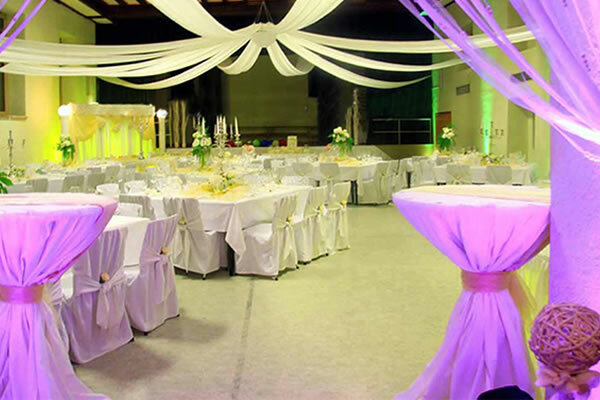 SA Events Hall is a modern fully air conditioned multi-purpose events center with facilities to host Banquets , Wedding Receptions, Conferences, Seminars, Symposiums, Exhibition, Lectures, Training and more. 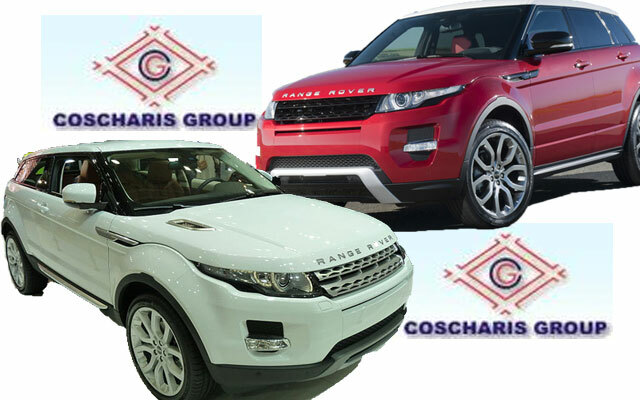 Visit us at Plot 1 Block 94 ,Providence Street, Tawa Badru Street, Off Lamgbasa, Eti Osa Lekki ,Lagos. At first glance, Yaba is like many other parts of Nigeria’s sprawling commercial capital: a cacophony of car horns and shouting street vendors, mingling with exhaust fumes and the occasional stench of sewage. Tragedy was averted Tuesday morning in Lagos as a 33, 000 litres Jet A1 tanker with fuel tumbled at the Murtala Mohammed Airport, MMA. The incident occurred around the road close to the access gate of the airport. Those who were present at the scene disclosed that the tanker was coming from Ikeja and heading to the international wing of the airport before the accident occurred around 10am. 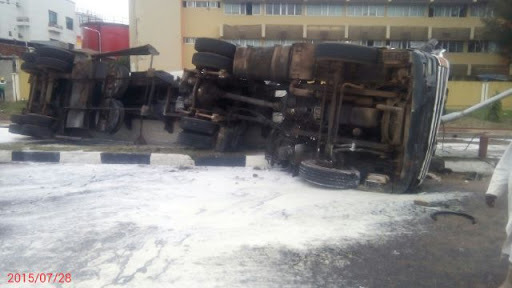 Filled to capacity with Aviation fuel, the tanker with the Lagos Registration number AAA 991 XQ fell when the driver wanted to navigate at a sharp bend around the airport according to Daily post Nigeria. As part of activities marking its second anniversary, Coscharis Mobility Ltd – Sixt Nigeria, has visited the Compassionate Orphanage, in Lagos, western Nigeria. While commissioning official dedication of a building re-roofed by Sixt Nigeria for the orphanage, Mr. Christian Chigbundu, GM/CEO Coscharis Mobility Ltd – Sixt Nigeria, accompanied by Mr. Karsten Jaensch, Head, Training & Development of Franchise Countries and Mr. Sebastian Szautner, International Junior Franchise Manager, Sixt commended the activities of the orphanage while promising to help convey its message to the company in Germany according to PM News. 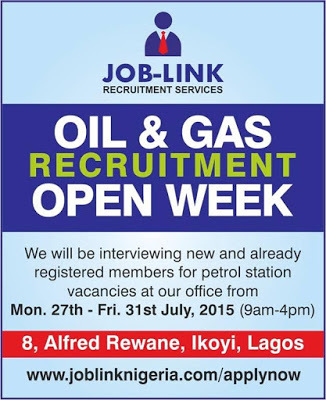 Job-Link Recruitment Services invites all interested candidates to attend an Oil and Gas Open Week from Monday 27th July till Friday 31st July at its head office on 8 Kingsway Road, Ikoyi, Lagos. All registered members of Job-Link as well as new job seekers can attend and attendance is free. Job-Link is one of Nigeria’s fastest growing social enterprises in the human resources sector. The company focuses on connecting candidates with non-managerial jobs in top companies as well as building the skill set of its members through employability trainings, career counselling and other services. Registration can be completed at our centre on 8 Kingsway Road, Ikoyi, Lagos or online at www.joblinknigeria.com. Nigeria Customer Service Awards is based on merit declares Aliyu Ilias according to DailyPost. This years event will come up on October 8, at the prestigious Four Point Hotel by Sheraton Hotel Ikoyi, Lagos. 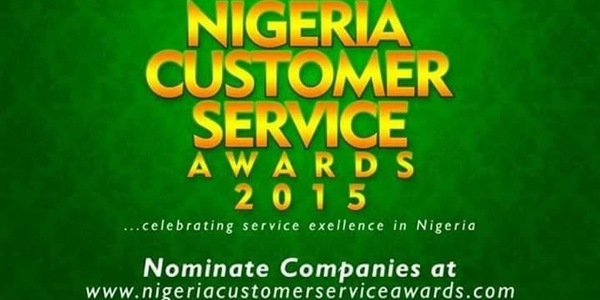 The customer service awards date falls within the International Customer Service week of October 2015.